Jerry Nelson, a pioneering astronomer known for his innovative designs for advanced telescopes, died June 10 at his home in Santa Cruz. He was 73. 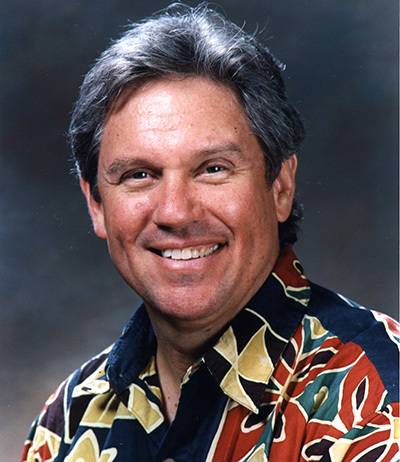 Nelson conceived the revolutionary segmented mirror design of the Keck Observatory's twin 10-meter telescopes, and he developed new techniques to fabricate and control the mirror segments. Each telescope has an array of 36 hexagonal segments, precisely aligned to act as a single reflective surface. This design has since been used for other large ground-based telescopes, and the next-generation James Webb Space Telescope also has a segmented primary mirror design. Nelson also played an important role in the development of adaptive optics technology, which sharpens the images from ground-based telescopes by correcting for the blurring effect of Earth's atmosphere. As founding director of the Center for Adaptive Optics, a National Science Foundation Science and Technology Center based at UC Santa Cruz, Nelson helped pioneer the use of adaptive optics in astronomy. Claire Max, director of UC Observatories and the Bachman Professor of Astronomy and Astrophysics at UCSC, said Nelson was a renowned figure in the international astronomy community. "Jerry's impacts on the field of astronomy and astrophysics are legendary, and we will all benefit from his legacy for many years to come. He was a wonderful colleague and mentor to many of us," she said. Nelson earned his B.S. in physics at the California Institute of Technology and his Ph.D. in physics at UC Berkeley. From 1970 to 1981, he worked at Lawrence Berkeley National Laboratory, and he was a professor of astronomy at UC Berkeley from 1981 until 1994, when he moved to UC Santa Cruz. Much of Nelson's early research was in the area of high-energy physics and astrophysics. He analyzed the results of particle accelerator experiments and studied high-energy astrophysical phenomena such as pulsars using innovative astronomical instruments of his own design. Nelson presented the concepts that led to segmented-mirror telescopes in a series of papers and technical reports starting in 1977, often working with UC colleagues Terry Mast and Gary Chanan. The largest telescopes at that time had been fashioned by polishing a single glass "blank" to the requisite precision of a small fraction of the wavelength of visible light. In order to maintain that surface, the polished mirrors had to be very thick and were therefore heavy, which was a problem for larger mirrors. Nelson's idea was to create a single, high-precision optical surface by supporting individual hexagonal mirrors in a close-packed honeycomb configuration. Making this concept a reality required a series of innovative ideas for fabrication, measurement, and control of the mirror segments. "The segmented-mirror design will be seen as one of the major turning points in telescope technology and one that opened the path to much larger telescopes on the ground and in space in the coming decades," said Michael Bolte, a professor of astronomy and astrophysics at UC Santa Cruz. Bolte, who serves on the TMT Board of Directors, said the TMT's 30-meter primary mirror design is essentially a scaled up version of the Keck primary mirrors. After suffering a stroke in 2011, Nelson coped with significant physical limitations but remained deeply engaged in TMT design work. "He was a wonderful colleague. 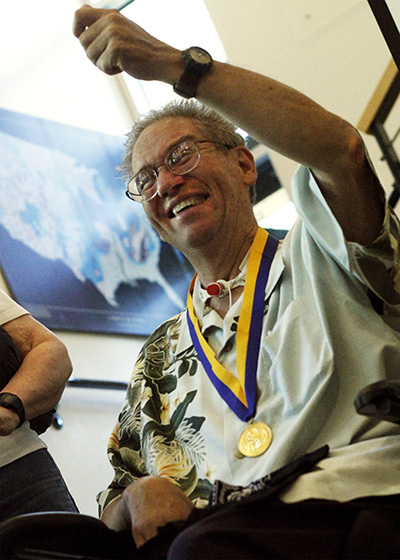 His endless curiosity always pushed the scientists around him to think more deeply, and his persistence and continued excellence after his stroke were inspirational to everyone," Bolte said. A symposium to honor Nelson was already planned for July 13 and 14 in Santa Cruz, featuring talks by many of the eminent astronomers who worked with him over the years. The gathering will now serve as a memorial celebration of his life, Bolte said. A member of the National Academy of Sciences, Nelson received many awards and honors for his achievements, including the 2010 Kavli Prize in Astrophysics, the Benjamin Franklin Medal in Electrical Engineering, the André Lallemande Prize of the French Academy of Sciences, and the Dannie Heineman Prize for Astrophysics of the American Astronomical Society. Nelson is survived by his wife, Jocelyn Nelson; his sister Jeanne Moat; two children from his first marriage, Leif and Alexandra; and three grandchildren. His first wife Victoria died in 1992.